Live updates from the fate of Malaysia Airlines Flight 370. For you Malaysian and Chinese peeps, I'd figured you have heard the news by now. A Malaysia Airlines flight en route to Beijing, China disappears about an hour into the flight. Vanished, all comms cut off abruptly. My payers for all those aboard this flight. It's been 6 hours, any news on the airline? At best, if it was still a flight it would need a refuel by now I'm sure. Dude... it's been more than 27 hours since the last contact with the plane. It went missing March 8, around 0230 (+8 GMT). At that point it had around 7.5 hours of flight time in the tanks, but it never made any kind of contact even then. By now, things are looking pretty grim. The Vietnamese found oil slicks in the vicinity of the plane where it was last contacted. The possibility of terrorism is also high, we're looking at 239 deaths here. Ladies and Gentlemen, we are deeply saddened this morning with the news on MH370. Malaysia Airlines confirms that flight MH370 had lost contact with Subang Air Traffic Control at 2.40am, today. There has been speculation that the aircraft has landed at Nanming. We are working to verify the authenticity of the report and others. Flight MH370 was operated on a Boeing 777-200 aircraft. It departed Kuala Lumpur at 12.41 am earlier this morning bound for Beijing. The aircraft was scheduled to land at Beijing International Airport at 6.30am local Beijing time. This flight was a code share with China Southern Airlines. We are working with authorities who have activated their Search and Rescue team to locate the aircraft. Our team is currently calling the next-of-kin of passengers and crew. The flight was piloted by Captain Zaharie Ahmad Shah, a Malaysian aged 53. He has a total flying hours of 18,365hours. He joined Malaysia Airlines in 1981. First officer, Fariq Ab.Hamid, a Malaysian, is aged 27. He has a total flying hours of 2,763 hours. He joined Malaysia Airlines in 2007. Our focus now is to work with the emergency responders and authorities and mobilize its full support. Our thoughts and prayers are with all affected passengers and crew and their family members. The airline will provide regular updates on the situation. The public may contact +603 7884 1234. For media queries, kindly contact +603 8777 5698/ +603 8787 1276. ^ There are some rumors claiming the plane may have been hijacked. Just rumors though, nothing solid. Sorry, my time zones are ALOT different then yours, I'm 12+ hours behind you and I didn't realize the flight had been up so long, I'm reading the same timezone context your reading. After all, it is only March 8th evening here where I'm located even now. Blue-Sensei - Got some really good info there, thanks for the share. For a live update, refer to the link in the first post. Looks like they found the plane. A door and a tail (most likely the vertical stabilizer). From everything I've read so far it is tragic but this must have been a terrorist act. A plane doesn't just completely disappear at 35,000 feet with no distress signal, no change of heading or altitude (flightradar24 data is twice a second), sudden loss of ATC radar contact (which doesn't rely on transponders) and no found debris or oil slick yet unlike the air france flight 447 which they found debris 1 day after the crash occured. 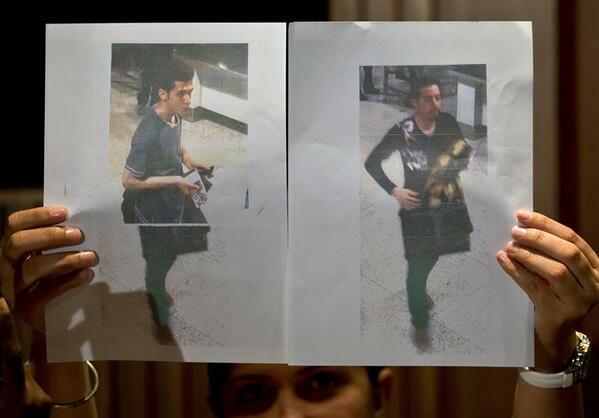 Very sad all around, up to intelligence agencies now to sort out who these two passengers were with stolen passports and to put the puzzle together. They did seem to find a floating pile of debris(quite a lot of it) but they're unsure if it's from the plane or not. Seems that terrorism is highly unlikely; one of the passengers using a stolen passport was headed for Germany to meet with his mother, while the other is an asylum seeker. However, this raises the possibility of sabotage, equally nasty. Why it sounded more like New Bermuda Triangle? "it simply vanished"